← The Five isn’t waiting around! The Chamber explains Yankee Homecoming this way, “a way to reinvigorate community pride and interest in the downtown.” And they wrap it all up after outlining the activities with, “Enjoy” Unfortunately, many have assumed this is a big Chamber event, basically a time to get locals and visitors to come and spend money while having a good time. They don’t even bother to explain what it is that is generating all this community pride and interest. 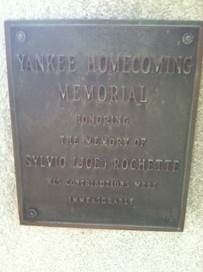 And the Yankee Homecoming Committee goes no further either on their website or booklet. They too see this as a big time for crafts, sidewalk sales and that word again, “Enjoy”. But that was not the original intent. To understand that motto will require understanding history in its proper setting. It’s one thing to recount the horrors of World War II while standing in restored, modern London. It’s quite another to see film and photos of a besieged city during the Blitzkrieg. When it comes to understanding the history of Yankee Homecoming, you need to step back in time and consider the city’s condition. When many see the pictures of boarded up Newburyport; they tend to see the ones that show right after the NRA had seized many of the buildings in town with eminent domain. More often than not before that, Newburyport was a typical city but it had a terrible reputation. People from as far as New York City knew it. We had the same reputation as metropolitan centers of today like Elizabeth, NJ, Lawrence, Lynn and Roxbury. Our version of Lawrence Mayor Lantiqua, Bossy Gillis, was notorious and known as far as Chicago. When visitors came, they often hurried past Newburyport as they were on their way to the wildlife preserve or the beaches. Not only did we have a bad reputation for crime and corruption in the late fifties, many in town were dispirited and had lost hope there would be any improvement on the horizon. To exacerbate the situation, businesses all across American were leaving the urban centers and heading out to the suburbs. This was the beginning of the commercial “strip”. We still have our version strung along Route One in Salisbury. The result was the loss of vibrancy in city centers across the country. Places such as Gloucester, Newburyport, Portland, Portsmouth and Portland were suffering with depressed inner commercial districts. It was about that time in 1957, a New England artist, Jack Frost, with some powerful financial backers had proposed a strategy that would attempt to counteract this abandonment. He advocated “Yankee Homecoming” festivals that would serve as a “national pilgrimage back east where it all began.” Frost hoped to restore pride and interest in old cities like Newburyport by encouraging all the “settlers” whose families had originally come from the east to return and explore the historic homesteads where their ancestors had once lived. In addition, the historic sites in those cities would encourage many to return to find their “roots” and at the same time understand the “roots” of their own national identity. Thus, history was center to everything. As Mr. Frost from his Boston headquarter went throughout New England proclaiming his brainchild, he met by chance in Cape Cod in 1957, Joe Mathers, then manager of the Newburyport radio station WNBP, and Frost shared his idea with him. Frost later met with George Cashman and encouraged them both to approach the Chamber of Commerce. There was some resistance to this idea at first but finally, the Chamber and the city agreed to be a Yankee Homecoming City. 1958 was set to be the first time the Yankee Homecoming celebration would be conducted and no less than 29 cities agreed to hold the event. George Cashman took the celebration one step further and made sure the festival would be a way to promote the city by encouraging those descendants who had roots here in Newburyport to return, and to make sure visitors understood the city’s national significance. The Yankee Homecoming event would be held one week before the day the Coast Guard was born, August 4th. This was, I might add, years before Congress officially designated Newburyport, the Birthplace of the United States Coast Guard. Years passed and the invite was extended to include anyone who ever lived here, had ancestors here once or had visited Newburyport even once, therefore guaranteeing an expanding attraction for the event. Mayor George Lawler felt Yankee Homecoming would be instrumental in “promoting the city,”. It is this over-arching motivation that is beyond economic concerns that has made the Yankee Homecoming Committee always separate from the Chamber of Commerce. And there was that bad reputation to overcome! One of the unintended pluses (or was it intended) that came from the Yankee Homecoming celebration were the flood of visitors who began to describe Newburyport as a “beautiful” city. It was this influx of appreciative visitors that began to change the attitude of the locals who in turn began to have great pride in their Clipper City once again. George Cashman, one of the co-founders and the first chairman in 1958, always knew that it was the renewed love of our history that would be the spark for the rejuvenation of the downtown and the city at large. In fact, he strongly felt that the Newburyport Redevelopment Authority (NRA) and the Newburyport Area Industrial Development (N.A.I.D.) would not have come about if it hadn’t been for the Yankee Homecoming Celebration. And Mr. Cashman knew that it was our history that firmly planted Yankee Homecoming especially the recognition of the birthplace of the United States Coast Guard. Later, the Chamber and the City began to aggressively recognize the intense value of the annual celebration. A Yankee Homecoming flag was created in 1966 and is raised and lowered at the opening and closing ceremonies. In that same year, the Yankee Homecoming monument in the waterfront park was dedicated in 1966 and, like the flag, is a centerpiece today, as it has been for the past 44 years. Some in the last few years have suggested that the celebration is not worth the effort. That so many come and clog our highways and cram our downtown with little immediate financial return for the city. But they have also like the Chamber and the Yankee Homecoming Committee; forgotten that the festival is to invite as many people across the country to come, discover and enjoy our historic city. As the Yankee Homecoming Celebrations continue, word keeps spreading about our “beautiful city”, and more visitors come who wish to trace not just their family’s history back in time but to remember the significant national events that Newburyport is so proud to embrace. The future Yankee Homecoming Committee needs to return to the original purpose of this festival. It is not a money-making chamber event. It is not a shallow, meaningless “fun time”. By returning to its original purpose, we will have re-invigorated its goals, prosper Newburyport far beyond the short-term profits and cause Newburyport to be re-known for its important history. 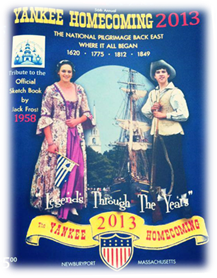 Not only did Yankee Homecoming spawn the Newburyport we have today; it is continuing to spread our fame and our value to the nation – and thus far surpasses making a fast buck at the food court any day! “Success of Yankee Homecoming is spelled V-O-L-U-N-T-E-E-R-S”, As I See It, by Ralph Ayers, Newburyport Daily News, July 1, 2010. “Cashman, Port’s ‘patriarch’ remembered as ‘bigger than life’, by Nick Pinto , Staff Writer, Daily News of Newburyport, December, 2006. Yankee Homecoming reflection of Port’s pride, As I See It, by Ghlee E. Woodworth, Newburyport Daily News, July 26, 2012.
http://newburyportchamber.org/pages/YankeeHomecoming, 2013 mention of Yankee Homecoming. PS. Though many events have overshadowed its original goals, by taking some of the historical tours and reveling in our city’s significance by attending a lecture; you, as an attendee, are recapturing those objectives. Some of the week’s events are listed here. Please attend and remember our history! This entry was posted in Art & Culture, Businesses, Downtown, Economics, Education, Entertainment, Health and wellness, Heritage Tourism, History, Planning, Quality of Life, Recreation, Restoration, Tourism, Tours. Bookmark the permalink. THIS IS A ‘BIG’ DEAL! That “Vision Thing” can be pricy!